Making expressions fun is....well....difficult to say the least. I mean, to *ME* it is fun (I know, I know...I also loved Logic in college) but the kids aren't so convinced of its redeeming qualities. So to spice things up during a unit on Communication, I had the kids create "secret codes" using expressions. The students then solved each expression to make sure the answer was unique (no two letters could have the same end product). This part is VERY challenging for the students. It actually took them two days. The process of thinking of problems, and then making sure they had unique values, really got their 4th grade brains moving! Once all of the expressions were created, they did not reveal the expression answers on the final draft. Those were turned in to me. Their cipher key just had the letters and expressions. Finally, they created a finalized draft of the secret code, with the cipher key above it, and viola, there were 30 codes to be solved! Once they were all created (and checked for validity by me) I made the board interactive by placing index cards right next to the codes. During Math Workshop, students could go to the board, grab an index card, and begin to solve the expressions to decipher the code. 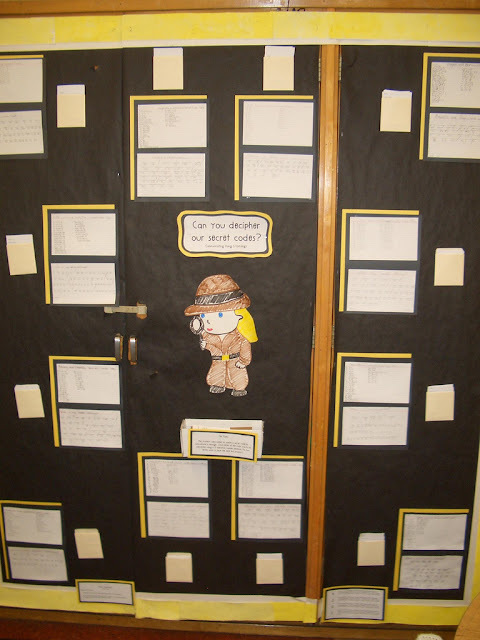 (they put their answers into the box that is stapled onto the board under the detective) A LOT of math that the kids really never got bored of! I love this idea! My kids would totally love it as an enrichment option! Thanks so much for sharing! You are so full of amazing ideas! Thanks for sharing another great one. Wow! I love this idea. I also appreciate the fact that their sentences could connect to other curriculum areas.